Led by a sensational Grange vintage, Penfolds will release its 2016 collection across Australia on Thursday 20 October. The predictably impressive line up, includes many highlights: Reserve Bin A Adelaide Hills Chardonnay 2015, Bin 128 Coonawarra Shiraz 2014, Bin 28 Kalimna Shiraz 2014, Bin 150 Marananga Shiraz 2014, Bin 389 Cabernet Shiraz 2014, RWT Barossa Valley Shiraz 2014, Bin 707 Cabernet Sauvignon 2014 and Grange 2012. It also raised a couple of doubts. Will the leesy, lemony 2014 Yattarna Chardonnay flesh out and blossom with age? Will the fruit in Magill Estate Shiraz 2014 eventually absorb the wine’s abundant oak? Winemaker Peter Gago’s confidence in both gives hope. He’s a credible source. But should buyers shoulder the risk, or wait and come back to the secondary market a few years down the track? I base my notes on the wines on a pre-release press tasting hosted by Penfolds in Melbourne on 20 September. As the wines haven’t been released yet, I’ve quoted Penfolds recommended retail prices. For most wines, prices should fall below these levels as retailers fight for your business. Bin 51 shows the soft, round, easy drinkability of rieslings from the 2016 vintage. The aroma combines floral and citrus varietal characters which carry through to a round, juicy seductive palate. Keen acidity accentuates the citrus-like varietal flavour as it cleans up and dries out the mildly grippy finish. The lowest priced of Penfolds three chardonnays shows its cool origins with grapefruit- and white-peach-like varietal aromas and flavours. These form the heart of a delicious, pure, varietal dry white – though fermentation and maturation in older French oak barrels added significantly, if unobtrusively, to its elegant structure, texture and flavour. Turn up the volume. After the subtle, pure, elegance of Bin 311 we arrive at a powerful chardonnay combining intense fruit with equally intense winemaking-derived flavours. However, the great fruit comfortably absorbs the influence of new, charry oak (40%), spontaneous fermentation and full malolactic conversion (a secondary fermentation converting malic acid to lactic acid). Lemon-butter-like varietal flavour and tang; charry, spicy oak; and nutty, lees-maturation flavours all come together in an impressive, elegant, fine-boned chardonnay. Is the emperor naked? Winemaker Peter Gago urges patience and time for the 2014 flagship to show its best. Certainly it’s delicate, leesy, lemony, taut, and austere at this stage. Will the underlying nectarine-like flavour blossom with age, as Peter believes? Yattarna’s provenance supports his belief, but buying it remains an act of faith. ­Lots of ripe, upfront fruit and soft tannins give drink-now appeal to this blend of cabernet sauvignon (52%) and shiraz (48%) – although a chewy, Penfolds richness suggests good drinking for some years yet. Cabernet contributes herbal and blackcurrant-like notes that punch through the generous shiraz and background sweet oak. Bin 138 takes us away from the multi-region blend to Penfolds’ heartland, the warm Barossa Valley. Deep with crimson rim, almost opaque. Earthy, beetroot- and black-cherry-like aromas, with the aromatic, musk-like lift of grenache. Mouth-filling, warm flavours reflect the aroma. Earthy, spicy, fruity finish with soft tannins. Four hundred kilometres south of the Barossa, Coonawarra’s cool maritime climate produces the elegant, fine-boned Bin 128 shiraz that contrasts with the opulence of the warm-grown style of Bin 28. Finessing in the Coonawarra vineyards and winemaking in recent years saw a maturing of the style. Medium to deep, crimson-rimmed colour; fragrant and attractive aroma showing a cool-climate floral side of shiraz; sweet, red-berry and spice flavours; elegant, succulent palate with fine tannins giving backbone and satisfying dry finish. Although originally from Penfolds’ Kalimna vineyard in the northern Barossa, Bin 28’s sourcing diversified as production increased. However, it retains its full-bodied warm-climate shiraz style – spectacularly so in 2014: Opaque red-black with crimson rim; aroma of black cherry with savoury soy- and black-olive like notes; big, generous palate of sweet, pervasive fruit, meshed in soft, mouth-coating tannins. Warm, rich, satisfying – and a litmus of Penfolds quality. Kalimna in the northern Barossa remains the capital of what some call “Grange country”. However, the Grange mantle extends to Marananga in the western Barossa and, following extensive planting of the in the 1990s, volumes increased sufficiently to create a sub-regional expression in Bin 150. “Opaque red-black with crimson rim; intensely aromatic, combining, plums, earth, oak and that special, alluring Penfolds lift; gorgeous, seductively plush plate, juicy and lively, with sensuous fruit – aided and abetted by plush, pillow-soft tannin. A complete and unique red”. Textbook cabernet sauvignon: “Deep red-black with crimson rim; varietal aroma of blackcurrant, herb and mint with subtle undertone of oak; lively, fresh palate reflecting the aroma, mouth-filling but elegantly structured with assertive though fine cabernet tannins”. Built for long-term cellaring, Bin 389 combines cabernet and shiraz from two warm regions – the Barossa Valley and McLaren Vale – and two significantly cooler areas –Wrattonbully and Coonawarra. It’s an harmonious combination in the dense, powerful Penfolds style: “Opaque red-black colour with crimson rim; aroma of earth, soy, black olive and ripe black cherry; buoyant, dense palate, saturated with dark fruit and savoury character, reflective of the aroma; layered and deeply integrate tannins”. In the Penfolds red line-up, St Henri alone matures in 50+ year-old large oak vats rather than small barrels. However, the absence of obvious oak flavour doesn’t rule out other winemaker influences. Winemaker Peter Gago describes St Henri as “Cleverly propelled by just the right amount of formics and VA [Peter’s italics]” – jargon for compounds that develop naturally in the presence of air and in small amounts can give life and vivacity to wine. 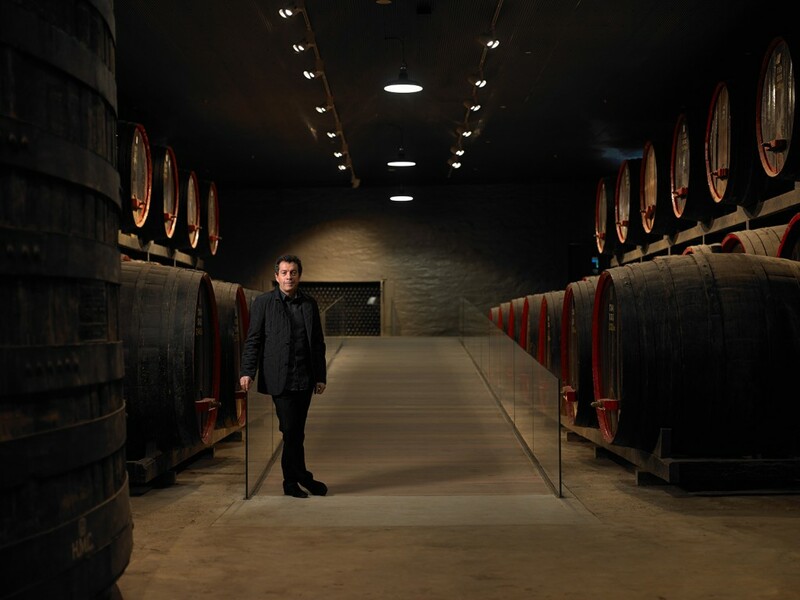 (Grange creator Max Schubert, at times criticised for the amount of VA [volatile acidity] in Grange, confessed to ruining a few batches). However, individual thresholds for detecting these compounds vary, meaning those with greater sensitivity may be distracted by them. “Deep red-black with crimson rim; a touch of VA lifts the subtle fruit aroma giving the wine another dimension; glorious palate – elegant and refined with intense, potent pure ripe-cherry-like fruit, bound with grippy but ripe and fine tannins. Beautiful wine, destined to evolve for decades”. In late 1982 Max Schubert’s hand-written proposal to the board of Adsteam (Penfolds owner at the time) resulted in the creation of Magill Estate Shiraz in the 1983 vintage. Schubert’s proposal, supported by Penfolds chief executive Ian Mackley and general manager Jim Williams, saved the inner-suburb vineyard from the bulldozer. The vineyard produces a medium-bodied style. In 2014, a substantial wine, with superb fruit, seems dominated by new oak. The fruit may absorb the oak over time, but only time will tell. Where Grange shows the immense power of warm-grown shiraz matured in American oak barrels, RWT captures a more refined expression, matured in French oak. “Deep red-black with crimson rim; intensely floral, aromatic expression of shiraz with a spicy note and cedar-like perfume from the barrels; oh, so fine palate of ripe, buoyant shiraz fruit, layered with fine tannins and spice that could be derived from both the fruit and oak”. Bit by bit Bin 707 closes the price gap on Grange. An equivalent wine in quality, if not yet in reputation, 707 ages gracefully for decades. Chateau Shanahan occasionally marvels at the 1986, one of the greatest 707s of all and, I believe, a more complex wine than Grange of the same vintage. The 2014 reveals all the dark and brooding glory of Bin 707: impenetrable, crimson-rimmed, red–black colour; deep, succulent varietal blackcurrant flavours; additional savoury elements, reminiscent of soy and charcuterie; a distinctive, sweet oak character that permeates the fruit, but with time will disappear into it; and powerful but fine oak and fruit tannins to see the wine through decades of cellaring. This is a great wine. One of the great vintages. “Opaque red-black colour with vivid crimson rim; earth, sweet, ripe fruit, oak and black-olive flavours all swirl together into one deep, powerful whole of great vibrance, freshness and layered depth. This is Grange in all its idiosyncratic glory. Best drunk from about 15 years after vintage”.